paper holy card prayer on back SAINT FAUSTINA'S PRAYER FOR A MERCIFUL HEART O Jesus, I understand that Your mercy is beyond all imagining, and therefore I ask You to make my heart so big that there will be room in it for the needs of all the souls living on the face of the earth, and the souls suffering in Purgatory. Make my heart sensitive to all the sufferings of my neighbor, whether of body or soul. O my Jesus, I know that You act toward us as we act toward our neighbor. Make my heart like unto Your merciful Heart, transform it into Your own Heart that I may sense the needs of other hearts, especially those who are sad and suffering. May the rays of mercy rest in my heart. Jesus, help me to go through life doing good to everyone. Amen. 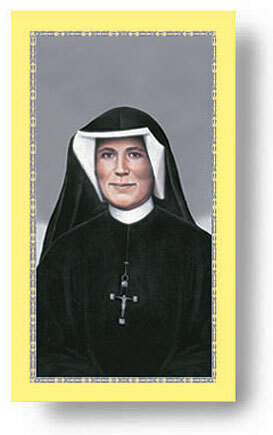 "Saint Faustina's Prayer for a Merciful Heart" is excerpted from The Divine Mercy, Message and Devotion, Fr. Seraphim Michalenko, MIC and Vinny Flynn, copyright 1995 Congregation of Marians of the Immaculate Conception, Stockbridge, MA all world rights reserved. Printed with permission.